Saving with JBF...it's as easy as 1, 2, 3! 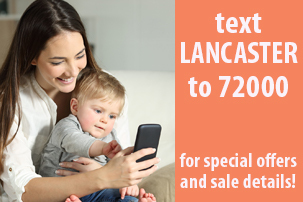 Experience Lancaster County's newest resale savings event where thousands of local families get MORE for LESS! We accept cash, debit cards, VISA, M/C or Discover. Shop 30,000 square feet of bargains! Everything is organized by size, gender and category. We'll give you a map, a shopping bag, and you can shop 'til you drop! 9am-9pm | Ticket required for sellers and special guests. 9am-9pm | Everyone welcome! Get your FREE ticket HERE. 8am - 5pm | Shop the restocked sales floor and enjoy FREE admission. No pass required! 8am-3pm | Many items are an additional 50% off and admission is FREE. No pass required! Take Rt. 30 West to the Rt. 283 intersection.Bear left and take Rt. 283 approximately 1 mile to the Millersville/East Petersburg Rt 741 exit. At bottom of ramp, turn right on Rt. 741. Follow Rt 741 for 1 mile. Spooky Nook Lanco is on your right. Take Rt 283 to Lancaster. Take the Landisville exit (Rt. 722). At top of ramp, turn left on State Road. Follow State Rd into East Petersburg.Turn right at traffic light in East Petersburg. Spooky Nook Lanco is 1/4 mile on your left directly across from East Petersburg School. Easy access to all baby and children items.